Generally, I'm well past the point where I become disinterested after watching multiple unfamiliar opening bands at any given live show. Every so often, though, I see a particularly captivating opening act and am reminded about why it's advantageous for a serious music fan to show up early to concerts. I had such an occasion in February, 2008, when I ventured out to a Snowden gig at The EARL and saw the first opening act, a new Athens band called Twin Tigers. I was intrigued beforehand because I had heard that Twin Tigers featured an ex member (Matthew Rain) of another Athens band, Psychic Hearts, whom I had enjoyed hearing on Georgia State University's radio station during the previous year. Still, I had no clue of what to expect beyond a vague idea that Twin Tigers might employ an industrial-edged post-punk sound similar to the Psychic Hearts material with which I was familiar. Instead, Twin Tigers emerged onstage to play an assortment of shoegazer-meets-Britpop guitar numbers that commanded my attention. The band had no recorded music available for purchase at this show, but I left The EARL that night resolved to watch the career of Twin Tigers with great interest. I've since seen Twin Tigers twice more and am assured that my favorable first impression of the band was no not misplaced. Onstage, Twin Tigers are a force of nature in a way that the best hard-edged, but catchy, guitar acts can be. Guitarist/vocalist Matthew Rain comes across as a blend of The Verve's Richard Ashcroft, Sonic Youth's Thurston Moore, and early David Bowie while the rest of the band, including fellow founding members bassist Aimee Morris and guitarist Enoch Bledsoe, keeps pace with a tight rhythm section and swirling guitar grooves. The band has improved up on their initial spark and I've found myself looking forward to each new opportunity to catch them here in Atlanta. 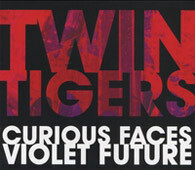 Curious Faces/Violet Future, the debut EP from Twin Tigers, may not have the same dynamic immediacy as the band's current live approach, but the six tracks are gems on their own terms that give an idea of what this band is capable of. Like any infant collection of tracks from a newly-emerged band, Curious Faces/Violet Future comes across as pleasurable rough draft of music that will inevitably live up to even greater potential. I'm reminded of the first couple of EPs that Interpol released prior to their full-length debut years ago. Twin Tigers hit the ground running with the psychedelic guitar pop hooks of Red Fox Run, a song that would have fit in on the first album from The Charlatans UK. Chaos is soon to follow with Watershed and Fantastic Plastic, two tracks that skirt the soundscapes of My Bloody Valentine, Pulp, and early Oasis with equal glee. Golden Daze sounds like a more glam-rock interpretation of The Jesus And Mary Chain. My personal favorite track on Curious Faces/Violet Future is the fifth song, If, a cacophonic masterpiece that conjures images of what might happen if U2's The Edge were to jam with Sonic Youth. The EP comes to an impressive close with the brooding bass lines and sonic bursts of Invisible Zombies, where Rain sings like a possessed Damon Albarn. Like the best debut EPs, Curious Faces/Violet Future introduces Twin Tigers as not only a band to watch, but as band to listen to. More importantly, this EP spurs anticipation in the listener to catch Twin Tigers in a live setting, which is how they really should be heard right now. Here's to the future of my current favorite Athens band.